Investment Platform for Family offices is built on Dynamics CRM platform and implements the best practices of working with successful, global, and multi-generational families. Family office or Single family office (SFO) can now manage investment, trusts, property management, day-to-day accounting, payroll activities, and legal affairs. Implements framework for advisors to derive their investment decisions based on process, checklist, and questionnaire. Opportunities can be sourced and filtered based on Portfolio sustainability, and Independent research. Investment policy and decision making with the help of crucial real-time research data feed, automatically filtered, and tagged for funds of interests. Monitor account performance with support for fixed income funds and hedge fund redemptions. Portfolio accounting (transaction-level detail) and performance analytics based on asset allocations. Proactive rule checking to define trading and portfolio policies. Automate preventive trade validation, overrides, and process to check pre and post trade compliance. Test and record compliance and compare with client commitments. Help clients with Family Cohesiveness, Strategic Planning, Philanthropy, Family Governance, and Trustee & Beneficiary Relationship. 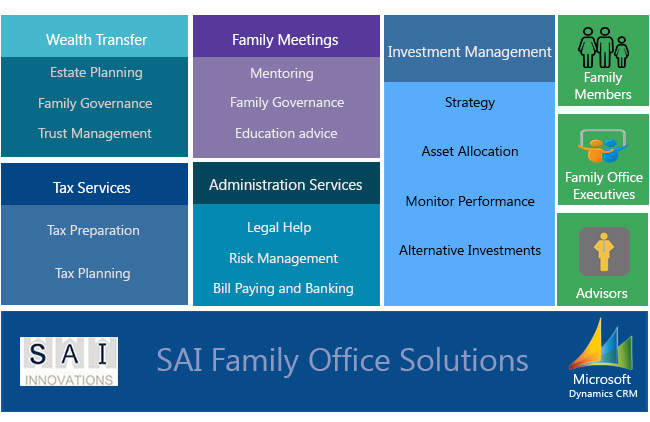 SAI solution will help the Family Offices overcome the challenges of managing the relationship among family members and their wealth growth. Family offices can serve as a trusted partner that ensures every task associated with the family’s wealth is handled. Deliver objective advice, based on strong due diligence to achieve the results required by wealthy families. Develop and implement a well thought out investment strategy based on current and future lifestyle, philanthropy, and opportunistic growth options available. Consolidated inquiry and statements - Easy to understand reports for customers that removes the complexity associated with financial investment interactions. Multi-currency support and easily customizable regulation engine helps Family offices reach out new markets.